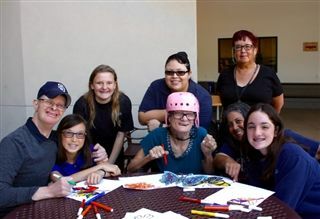 On Tuesday, September 6th, students in Middle School Service Learning hosted several friends from the Arc of San Diego for a morning of art projects and field games. Wanda Costello, Program Manager of the non-residential facility for developmentally challenged adults, spoke to the students, explaining the organization's mission and how it serves an important function in the local community. Pacific Ridge 7th and 8th graders visit Arc as part of their Service Learning rotation, sharing activities and building relationships with Arc's consumers each week.